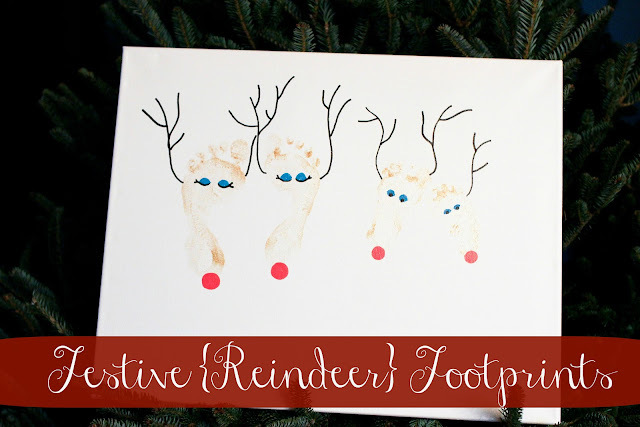 I'm sure by now you've all seen the pin floating around Pinterest that involves turning your kids' footprints into adorable little reindeer. In case you haven't seen it, you can find it here. In my head? This was going to be an easy craft to accomplish, considering that I would have my husband at home to help and at the very least wrangle the kids and their painted tootsies. In reality? It was.. well.. as easy as you could imagine when painting both your 2 year old's and your 5 month old's feet with glitter paint. This craft is fairly self-explanatory. Pour a little of your paint into a dish and paint onto the bottom of your kid's feet using the sponge brush. Utilize an extra set of hands to help hold your child over the canvas as you press their feet down. So, what holiday crafts have you been crafting lately? Any holiday outfits you're putting together for a soiree or family gathering? How about cooking up delicious holiday treats? 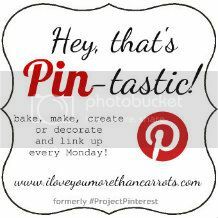 Be sure to pick your pin, do it, blog about it and link up here! All contributing posts with the "Hey, That's Pin-tastic" button will be posted to the official "Hey, That's Pin-tastic" pin board (with over 1,150 followers!) Be sure to grab the code for the button on the top left of the blog. (Highlight the entire code, press Ctrl+C and then paste it into the HTML section of your post) I can't wait to see what you've been pinning and doing! Welcome to weet 12 of "Hey, That's Pin-tastic!" These came out so stinking cute! I didn't have it on my list this year but just might have to add it. I love crafts that can be pulled out and displayed year after year! I did this design during Connors first Christmas, but I cut it out of fabric and sewed it on a cloth napkin. In my "I only have one child and can still pretty much do what I did before" brain, I thought if make a cute napkin for each kid. Needless to say, I have yet to do Cade one. I kind of want to throat punch my one child self for thinking if have all the time in the world for doing it! HA! The canvas turned out so cute and I love the glitter paint! What a great gift! that is so stinkin' cute!!!!!! 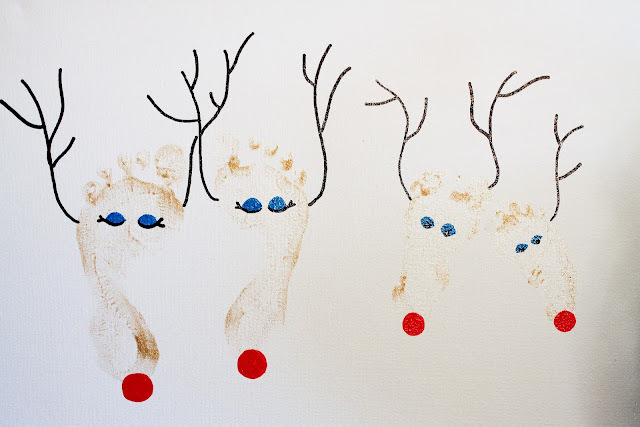 I love footprint crafts. That turned out so cute!